Saint Innocent, Bishop of Irkutsk, (in the world John), was descended from the noble Kulchitsky family. His parents moved from Volhynia to the Chernigov region in the mid-seventeenth century. The saint was born in about the year 1680, and educated at the Kiev Spiritual Academy. He accepted monastic tonsure in 1710 and was appointed an instructor at the Moscow Slavonic-Greek-Latin Academy as prefect and professor of theology. In 1719 St. Innocent transferred to the Alexander Nevsky Lavra in St. Peterburg, and was appointed Chief Naval Chaplain. In 1720 he served as Vice-Regent of the Alexander Nevsky Lavra. On February 15, 1721, Hieromonk Innocent was consecrated as Bishop of Pereyaslavl and appointed to the Peking Spiritual Mission in China. But the Chinese government refused to allow him to enter the country, because the Senate Commission on External Affairs had indiscretely characterized him as "a spiritual personage, a great lord," which the Chinese considered offensive and an insult to their traditions. The saint was compelled to spend three years at Selinginsk on the Chinese border, suffering much deprivation because of the uncertainty of his position, and grief from the disarray of the civil government in Siberia. Diplomatic blunders of the Russian Mission in China by Graf Raguzinsky, and intrigues by the Irkutsk Archimandrite Anthony Platkovsky led to the appointment of Archimandrite Anthony in China. Then, by decree of the Most Holy Synod in 1727, St. Innocent was named to be Bishop of Irkutsk and Nerchinsk. And so he entered into the governance of the newly-formed diocese. The proximity of the Chinese border, the expanse and sparsely-settled diocese, the great number of diverse nationalities (Buryat, Mongol, and others), mostly unenlightened by the Christian Faith, the lack of roads and the poverty — all this made St. Innocent's pastoral work burdensome and his life full of deprivations. Through a strange oversight of the Senate, he did not receive any money until the time of his death, and he endured extreme want. In these difficult conditions of scant funds, the Irkutsk Ascension Monastery still maintained two schools opened by him, one Mongol and the other Russian. The constant concern of the saint was directed towards the schools: the selection of worthy teachers, and providing the necessary books, clothing and other provisions for students. The saint toiled tirelessly at organizing the diocese, and strengthening its spiritual life. His many sermons, pastoral letters and directives bear witness to this. In his work and deprivations St. Innocent found spiritual strength, humility and insight. In the spring of 1728, the Baikal Region began to suffer a drought. Famine from a poor grain harvest had threatened the diocese already back in 1727. With the blessing of the holy hierarch, in the month of May, the churches of Irkutsk and the Irkutsk Region began to include a "Moleben for an End to the Drought" at each Liturgy, with the blessing of the holy hierarch. On Saturdays they sang an Akathist to the Mother of God, and on Sundays they served a Moleben. 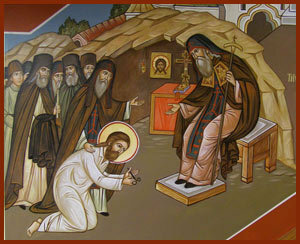 "These supplications," said the saint, "should end on the Feast of St Elias" (July 20). Indeed, on that very day, a storm raged at Irkutsk with such strong rains, that in the streets of the city water was up to people's knees, and thus the drought ended. Through the efforts of St. Innocent, construction was started on a stone church to replace the wooden one at the Ascension Monastery, and the boundaries of the diocese were expanded to include not only Selinginsk, but also Yakutsk and Ilimsk and the surrounding areas. 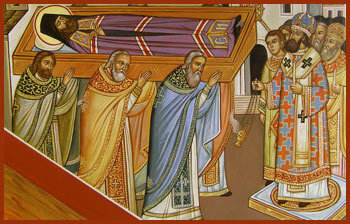 In the year 1764, the body of the saint was discovered incorrupt during restoration work on the monastery's Tikhvin Church. Many miracles occurred not only at Irkutsk, but also in remote places of Siberia, for those who flocked to the saint with prayer. This moved the Most Holy Synod to uncover the relics and to glorify (canonize) the saint in the year 1800. In the year 1804, a feastday was established to celebrate his memory throughout all Russia on November 26th, since the Icon of the "Mother of God of the Sign" [Znamensky] is commemorated on the actual day of his repose (November 27). 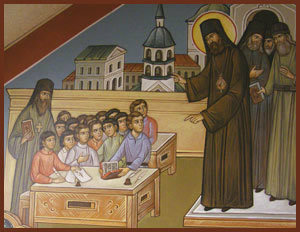 St. Innocent is also remembered on February 9, the day of the Translation of his Relics, as well as more recently, on September 2nd, the date when his relics, (which had been confiscated by the Communists), were joyfully received back in Irkutsk in 1990. In 1921, after carefully examining, documenting and describing the relics of the "Holy Man of Siberia," the Communists took the relics of St. Innocent from their shrine in Irkutsk and placed them in a Soviet anti-religious museum in European Russia. They were moved to another museum in Yaroslavl in 1939, and were exhibited as "mummified remains of an unknown Siberian man." Thanks to the careful documentation made by the Soviets in 1921, at the end of their rule the saint's relics were able to be identified, and in 1990, they were brought to the newly-reopened Tolga Monastery in the Yaroslavl Diocese, and preparations were made to return the saint's relics to Irkutsk. On September 2nd, 1990, the holy relics arrived in Irkutsk and were welcomed by the Bishop of Irkutsk, Bishop Vadim, and a huge number of people who had been waiting all day for the arrival of the Trans-Siberian express train that were transporting the saint's relics, and were placed in the Znamensky Cathedral, to the joy of all the faithful. (click here to see all 6 of the icons of St. Innocent's life that flank the steps in the entrance vestibule (narthex) of the temple.) Click here to read a very different Life of St. Innocent, with contemporary photos in Irkutsk.